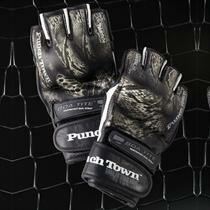 PunchTown has assembled one of the finest pairs of 4 oz. gloves to ever hit the MMA market. The leather is not only intricately detailed, but it''s an improved cowhide leather. The TAT2 leather surface is treated to be far more resistant to blood and sweat, as well as far less vulnerable to scratches and scuffs. Underneath this exceptionally pliable leather is a 3-layer padding system. The impact areas feature more dense protection while the outer-most layer provides a uniquely soft feel. Email your friend about the KARPAL eX TAT2 mk II Crush Professional MMA Gloves. Ask a question about the KARPAL eX TAT2 mk II Crush Professional MMA Gloves.